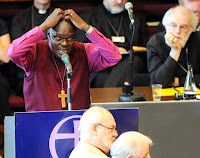 Now that the General Synod of the Church of England has decided to ordain women bishops, the penny will drop for many more good Anglican clergy and lay people. Inevitably, people will ask what took them so long - should they not have realised that the game was up when the synod decided to ordain women priests? When this is said, I always remind people of the Gorham judgement in 1850 when the privy council overturned the decision of the Bishop of Exeter and ruled that the Rev G C Gorham could be presented to the vicarage of Brampford Speke, despite his not believing in baptismal regeneration. Surely we did not need to wait until the ordination of women to realise that the Church of England was not really a part of the Catholic Church. Manning and Wilberforce converted as a result of the judgement, after all. Looking at it in this way, I think we can have some understanding of the agonising process of leaving behind the Church of England so graphically shown in the lives of both Newman and Faber. One Anglican priest described it to me in 1994 as like walking out of one's back gate into a wilderness, not knowing what was going to lie ahead. Bishop Burnham has said something similar in a statement published today (see below). In 1994, there were some extraordinarily ungenerous comments from Catholic priests in the public forum and I remember writing the editorial for Faith Magazine, expressing the hope that we would be able to welcome many good Anglican clergy who had led exemplary spiritual lives, some of them, for example, associated with the Society of the Holy Cross. "This decision will have consequences on the future of dialogue, which had up until now borne fruit, as Cardinal Kasper clearly explained when on 5 June 2006 he spoke to all of the bishops of the Church of England at the invitation of the Archbishop of Canterbury." Damien Thompson promised on Holy Smoke that the Catholic Herald would reveal how Bishop Andrew Burnham would lead many of his flock into the Catholic Church. You can now read Anna Arco's article, "Bishop to lead flock to Rome after synod vote" and Bishop Burnham's statement "Anglo-Catholics must now decide." He asks for magnanimous gestures from the Holy Father and from the Bishops' Conference of England and Wales. Regarding such magnanimity, I was struck by the appropriateness of Fr Ray Blake's quoting Pope Benedict's letter which accompanied Summorum Pontificum. The Holy Father pointed out that in the past, at critical moments, not enough was done to maintain or regain reconciliation and unity, and called us to open our hearts generously and make room for everything that the faith itself allows. Fr Longenecker also refers us to de cura animarum for reactions from the inside of the C of E. There, Fr Jeffrey Steel offers some informed guesses and a plea to the Vatican and the Catholic Bishops "Please, get it right this time." In a display of spirited independence comparable to the Soviet Agricultural Congress of 1951, the Church of England has voted to approve women bishops. This decision, much like that of the Society of Jesus in 1995 to embrace gender-inclusive language, is expected to send shock-waves throughout the world of aromatherapy and to have consequences extending into the August issues of The Tablet and beyond. The whole article is worth reading. His wrestling analogy is excruciatingly accurate.